The 2018 NCAA Gymnastics Championships men’s postseason has concluded and it ended just the same way it has the previous three years, with the University of Oklahoma reigning supreme and winning their fourth title in five years. Even though the finish was the same, this years NCAA Gymnastics Championships felt different, Oklahoma was not the overwhelming favorite to win it all. On paper the University of Minnesota had the overall highest team difficulty and their roster was loaded with an experienced senior class up for the challenge to win their programs first ever ncaa championship. Fresh of capturing the 2018 Big Ten title in the nations most competitive conference, The University of Illinois believed that this was their year to win in Chicago only a three hour drive away from their home gym. As if the defending champs needed anymore motivation with a title on the line and the nations current longest win streak they felt they had something to prove to the rest of the world. At the NCAA Gymnastics Championships awards banquet, the night before preliminaries Hunter Justus, team captain who has never lost a competition during his OU career did not win the Nissen, the most prestigious senior award. In addition, the College Gymnastics Association (CGA) had two new awards this year to give out, the “MVP” and the “Specialist Award”. Both awards were given to Ohio State phenom Alec Yoder respectfully and this left Yul Moldauer who was nominated for the MVP and Genki Suzuki for the Specialist with no postseason national awards for Oklahoma the nation’s number one ranked team. It kinda makes you wonder what is the criteria for these new CGA awards and who is on the committee that makes these decisions. Back to this in a moment. With only three teams out of six that can qualify from each preliminary session a few good teams were bound to be left out from team finals. On Friday’s session one, the University of Michigan, who placed second at Big Ten’s had a rough start on their first event which was parallel bars and the hole was too big to climb out of and they failed to make it to team finals. 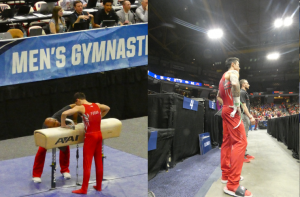 For session two, Ohio State was in the mix until the fifth rotation, when Big Ten all-around champion Sean Melton and the Big Ten all-around runner up Alec Yoder missed their release moves on highbar and that was the end of the team championships hopes. Penn State took advantage of the opportunity with a healthy Sam Zakutney, who was on fire hitting six for six and they finished up third and took the final spot to team finals. After not qualifying to team finals last year Penn State was stoked to keep their title aspirations alive. The team finals line-up was set with Oklahoma, Stanford, Minnesota, Illinois, Nebraska, and Penn State. The UIC Pavilion was buzzing with excitement and the gymnastics fans came 4,500 strong ready to witness a battle for the ages. Media outlets attending felt this was anyone’s title for the taking. Oklahoma the defending champions started the meet off on floor with Hunter Justus hitting a clean set. 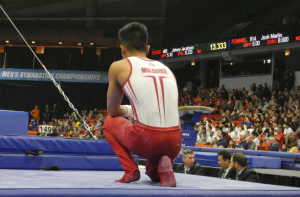 The anchor on floor for the sooners, Yul Moldauer boned his routine and stuck his triple twist dismount. Soon after his teammates begin chanting “MVP, MVP”. All I could think about when hearing this was that these guys did not forget the nations best gymnast two nights earlier was overlooked for the CGA MVP award. Moldauer score a 15.1 on his routine. Stanford was stellar on Vault and jump out to the lead after the first rotation. Illinois wasn’t too far behind and ended their first rotation on Pommel horse with a great set by Brandon Ngai. Minnesota started off on fire on highbar with amazing sets by Jalon Stephens and current senior national team member Shane Wiskus. This meet had the start gymnastics fans wanted to see. The second rotation for Oklahoma was like clock work. Everyone in the line-up hit their pommel horse sets. Illinois hit four out of five routines on Rings and Minnesota was five of five on floor with Wiskus being in the zone. The third rotation was when the competition broke open in favor of Illinois. They went absolutely bonkers on Vault with Bobby Baker making a statement by nearly sticking his kas two and half twist. Minnesota did their job on pommel horse and were looking to have their highest finish at NCAA Gymnastics Championships since the 1980’s. Head Coach Mike Burns had his team ready and up for the challenge. 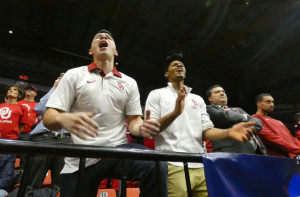 Oklahoma was less than stellar on Rings and found themselves nearly four points behind Illinois heading into the fourth rotation. The next rotation for Oklahoma on vault they had to make their move. There has been a few times this season that the sooners found themselves behind, their home opener in Ann Arbor against Michigan and in Columbus with Ohio State. Both times they came back to win, would they have enough to do it again? Yul Moldauer fourth up in the line performed a near flawless vault with a execution score of 9.7. Next up captain Justus, rocked a sky high handspring double front, the OU fans erupted in the arena. Oklahoma was back in the driver seat and took the lead back heading into the fifth rotation on parallel bars. Illinois in second, would move onto highbar. One of the most exciting events to watch in men’s gymnastics is highbar and the best team in country on high bar is Illinois. You hear the saying all the time in sports. A team takes the personality of the head coach and this is true when it comes to their high bar squad. Illini head coach Justin Spring was always a pleasure to watch during his competitive days. During the 2008 Olympic games he nailed his routine and stuck his triple back dismount was an historic moment in U.S. gymnastics history. With the momentum shifting to Oklahoma from their performance on vault, Illinois feeling the pressure was unable to capitalize on their best event and counted a few falls on highbar. Meanwhile on pbars OU begin to taste that victory was close. They hit one routine after another. When Peter Daggett stuck his double pike dismount it was a like he hit a grand slam. Everyone knew his story, two torn ACL’s, was going to redshirt the entire year, but convinced his OU coaches to put him in the line-up he wanted an opportunity to compete with his sooner brothers. Next up was Moldauer, he stuck his double front halfout dismount and the “MVP” chants began again this time OU fans got in on the action. On the other end of the gym Minnesota was landing vault after vault. They are having a perfect meet up to this point without any major falls. On the final event the top three teams are Oklahoma, Illinois, and Minnesota. 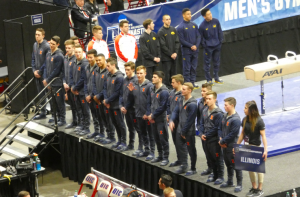 Illinois counted a fall on floor and Minnesota nailed five for five routines on parallel bars to sneak ahead of Illinois for a second place finish. 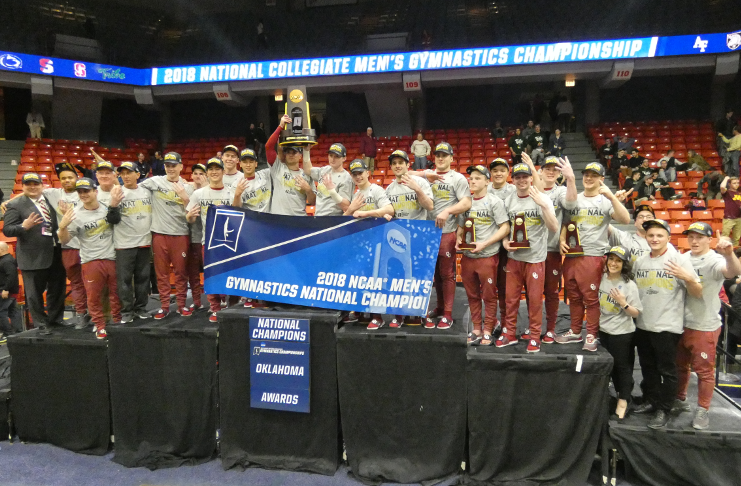 Oklahoma ending the competition on high bar hit set after set and captured their fourth straight national title, twelfth championship in program history to tie Penn State for most all-time in NCAA Gymnastics Championships history. Head coach Mark Williams ties legendary Penn State coach Gene Wettstone with nine titles of his own. Minnesota celebrated like they were the happiest second place team in history. They hit every routine in team finals and finally came through when it mattered the most as one of the favorites heading into the weekend. Job well done for coach Mike Burns. Illinois came up short but you have to admire the way they competed throughout the season with their high difficulty in their routines. Head Coach Justin Spring though disappointed by the outcome will have his team ready to contend next year. But in the end Oklahoma had something to prove and competed with a chip on their shoulder. Yul Moldauer competed like an “MVP” and won the All-Around, Floor, Vault, and Parallel bars titles. Hunter Justus ends his NCAA career without a lost and Oklahoma keeps the win streak alive with ninety-seven consecutive victories. This year’s NCAA Gymnastics Championships will go down as one of the best battles in history. Yul Moldauer 2018 NCAA All-Around, Floor, Vault, Parallel Bars Champion. Not so early Monday morning — After traveling from my home in Cabo san Lucas, Mexico to watch the Nationals in Chicago and to see former gymnasts and old friends , i am back home and reflecting —- WOW what an experience— yes, old friends, yes former gymnasts, yes, great gymnastics, yes, a great competition, yes, renewal of many great memories—– yes— everything that I had traveled back to my roots to see and do. This morning after a good nights rest, I opened my computer and this article caught my eye. WOW a report on a competition that I had just witnessed, written by Midnight Robin—– and yet while reading —– a whole different feeling about my three days in Chicago Before I had completed reading the article I felt tears running down my checks————– I was there, I was elated to see so many life time friends, I was amazed by the level of gymnastics and the performances of the gymnasts, I was excited and happy to see gymnastics alive and well in an area of the country that so many great gymnasts have had their beginning. ———- However, reading this article that Midnight Robin wrote created a new feeling , it provided a summary, greater incite into the teams, more information about the gymnasts, their coaches and the sport of gymnastics—- This type of reporting , this type of writing , this type of inside perspective, is what people in and out of the sport can relate to—— to motivate , to create interest and to help restore men’s gymnastics—– Midnight Robin, you have demonstrated the type of information that I believe is a great step to help men’s gymnastics to once again grow and develop– While in Chicago, I spent a lot of time talking with friends—- former coaches, former team mates, former gymnasts and the majority of our conversations were around how to make men’s gymnastics grow and return and exceed the “golden days of men’s gymnastics”————— This article is the kind writing that will create and develop interest in our sport. I urge all gymnasts to read it, I encourage coaches to share it with local sports-news outlets this article is way beyond a simple score sheet of the championship————– it brought —- to me—- interest—- intrigue, information and a desire to want even more information about gymnastics. 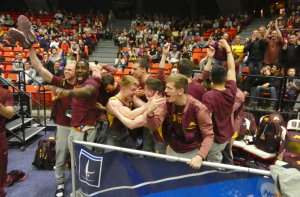 Thank you Midnight Robin for sharing your perspective of the 2018 NCAA Men’s Gymnastics Championship. I’m excited —- This is a model for reporting a gymnastics meet— that I believe will be read, that will create interest and a step to restoring interest and participation in men’s gymnastics. I appreciate your comments. Thank you for sharing your experience from NCAA Championships. It was a great meet!